When we started to get serious about going down the path of FIRE about 6 years ago we realized pretty quickly that investing in Vanguard index funds was the way to go. But invest in WHAT exactly? Terms such as VTSAX, VBTLX, admiral shares, investor shares were thrown around and, to the uninitiated, this might be information overload when all we are looking for is a simple guideline on what is what. This won’t be a crash course in what is a Mutual Fund or ETF (exchange traded funds). Neither this is going to be a debate over index funds v/s ETFs. Vanguard provides a detailed analysis in the differences and similarities between ETFs and mutual funds. To put it very simply, to the average personal (individual) investors – meaning regular Joe and Jill such as you and me – Vanguard offers 2 share classes (or variants) of passive, index funds and often times an ETF for the same underlying benchmark or sector that fund is tracking. We’ll look at the different options to invest in the S&P 500 through Vanguard. The lowest cost option is the Admiral shares. But their minimum investment is typically $10,000. 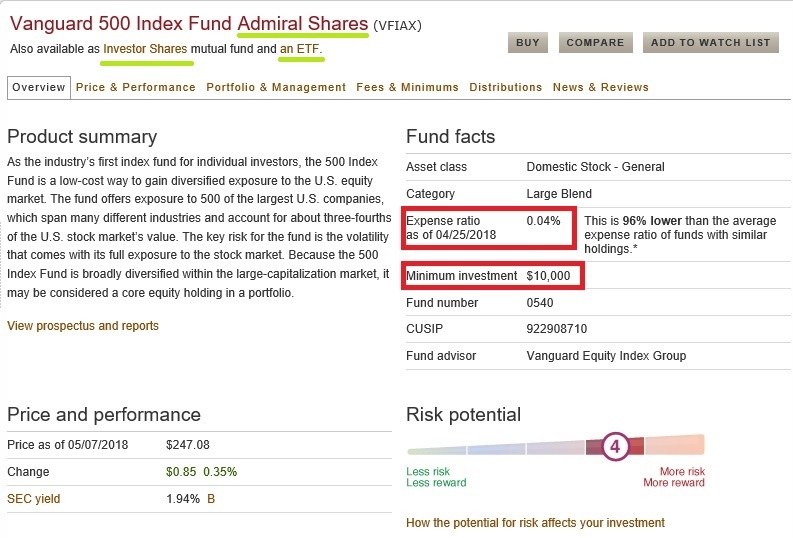 Vanguard 500 Index Fund Admiral Shares is the name of the fund. VFIAX is the ticker. Fun fact: All mutual funds tickers end in an “X”. Investor shares have a higher ER, at least twice of the Admiral shares, and their minimum investment is typically $3,000. 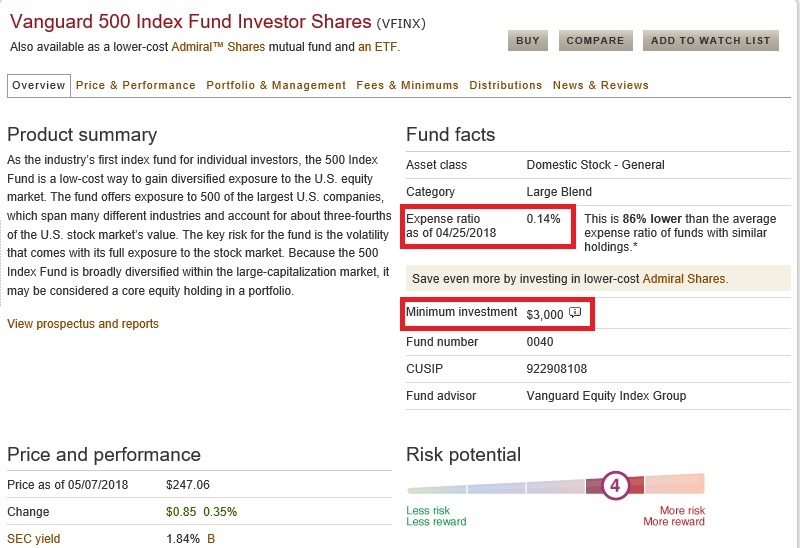 Vanguard 500 Index Fund Investor Shares is the Investor share fund for tracking the same S&P500 (you can reach it by clicking on the Investor share hyperlink given on the Admiral shares’ page on the Vanguard site highlighted in green in the above screenshot); VFINX is the ticker. If you don’t have $3,000 lying around, Vanguard has an option for you. 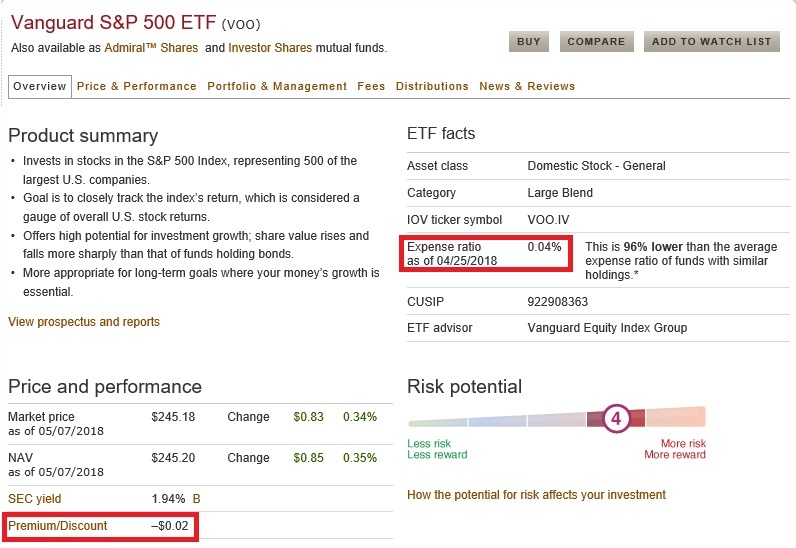 The Vanguard S&P 500 ETF; ticker VOO. The ER for this is 0.04%, same as the Admiral fund. Notice that the ticker doesn’t end in an “X” as ETFs are akin to stocks. Since the ETFs are essentially treated as stocks, there is a bid/ask spread and premium/discount. Also, Investor shares can be easily converted to Admiral shares once you meet the minimum threshold. Vanguard takes care of that. As far as I know, to move ETFs over Admiral shares you’ll have to sell your ETF and buy Admiral shares. If you have a taxable account you will have tax implications when you sell your ETFs. NOTE: I’m not a tax expert and you should consult a tax professional if you have questions. Materials presented here are for informational purpose only. 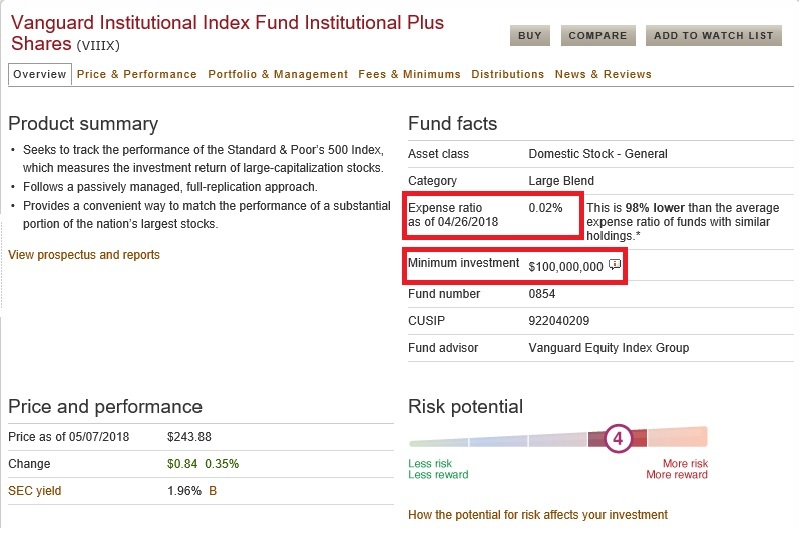 Vanguard also has funds to track the same underlying S&P 500 for its institutional investors. ER are lower than Admiral shares and look at the minimum – $100M!! These are, as the name suggests, for institutional (pensions; insurance companies, hedge funds and such) investors. Now there you have it: Go forth and invest! The other day I met an affable Financial Planner who’s looking to go to the same grad school as I had been to. We were talking and at some point the topic of fees arose in our discussion. This FP wasn’t pushy or trying to oversell the value of planning for the future but was still a bit coy about really admitting how fees add up. And rightly so, because her livelihood depends on the fees! This is the operating model of any FP, they make money off the fees they charge to maintain your money. I have nothing against her but this got me thinking how fees add up, even little marginal ones such as 0.061%. 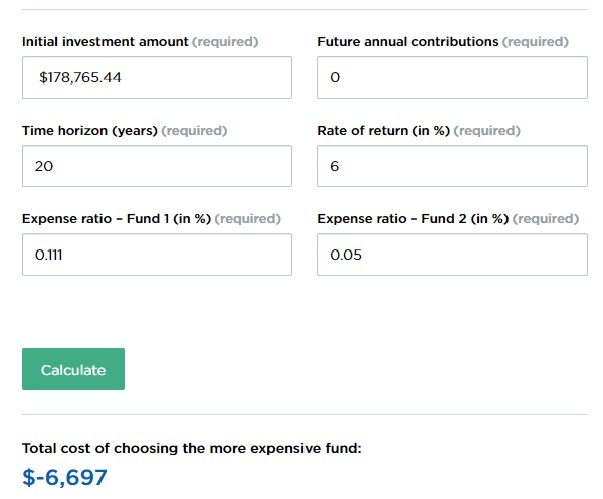 Let me illustrate this point by taking a look at my 401(k) investments and then compare it with the what-if scenario of putting the exact same amount in Vanguard index funds. I have to start off by acknowledging that I’m lucky to have a 401(k) plan that has low fees. Lower than a lot of other places. 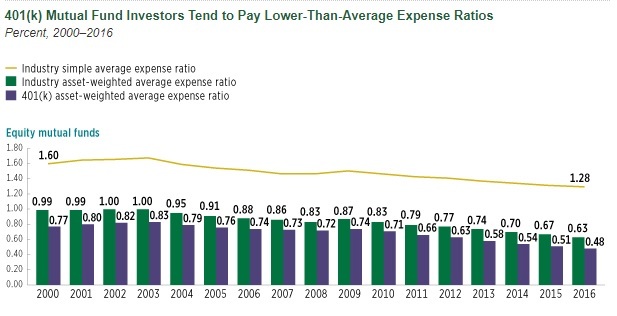 This article says that the average expense ratios for equity mutual funds in 401(k) plans is 0.48%. Before I started to look around I didn’t really think the average would be so low. Nonetheless we’ll run with this. In the table below you’ll see the actual breakdown of my investments in my company’s 401(k) plan. I have money in a bond fund, a targeted date fund, a large cap fund, a mid/small cap fund, an international fund, and in my company’s stock. All funds are Vanguard institutional funds and the operating expense ratios of all the funds are very low. Kudos to my employer! Side note: We can debate the efficacy of using 5 different funds to hold the money, but let’s keep that for another day! What skews the perfectly low ERs are the Administrative Expense of 0.08% that our 401(k) administrator, in this case Aon Hewitt, systematically charges across the board. My weighted average ER comes out to 0.111%. Not bad at all for being 4 times lower than the average! But still higher if not for the dang administrative expenses. Now let’s assume that I take this money out today and roll-over into an IRA, and invest in similar Vanguard funds. I have made a couple of adjustments, while keeping the weights of the bond, large cap, and international funds the same. Kept the same weight for the mid/small cap from the 401(k) and rolled into the VIMAX Midcap fund in the IRA. With these changes, my new weighted average ER comes down to 0.05%. Compared to the 401(k), that’s a difference of 0.061%. Again: We can debate the detriments of not just using VBTLX and VTSAX, another day …. This change would result in almost $7k in extra money over a period of 20 years, at 6% annualized return. Plug in your numbers here. I’ve deliberately left the future contribution cell blank to have apples to apples comparison. Dear readers, would love to know how your 401(k) plan expenses compare.